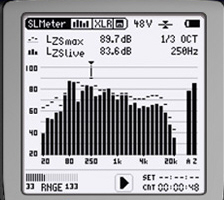 SPL means sound pressure level. In the following article you will read about basics of SPL-measurement. Noise is caused by vibrations of a sound source, such as cords or the loudspeaker diaphragm, and requires for its propagation, a medium, such as air, water or solid bodies. The vibrations of the noise source are transmitted to the medium. These vibrations and pressure fluctuations in the air can perceive our ears as sound. The fullness of what a person can hear is primarily determined by the volume and pitch. The greater the volatility, the louder the sound is perceived. Compared with atmospheric air pressure to the underlying sound pressure variations are extremely small: In normal speech, for example, they are less than a millionth of the air pressure!